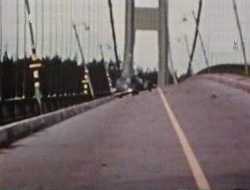 On November 7, 1940, at approximately 11:00 AM, the first Tacoma Narrows suspension bridge collapsed due to wind-induced vibrations. 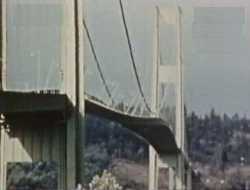 The bridge was across the Tacoma Narrows in Puget Sound near the city of Tacoma, Washington. It had only been open for traffic a few months. As the wind began to increase the bridge began to sway and this slowly became worse until the middle span of the bridge fell apart. This photograph shows the twisting motion of the centre span just before the structure failed.. The drastic torsional (twisting) movement is seen in this picture taken from the Tacoma end of the suspension span. When the twisting motion was at its maximum, the elevation of the sidewalk at the left was 28 feet (8.5m) higher than the sidewalk at the right. This photograph shows the same part of the bridge except at this point in time the bridge had dropped to the left as the bridge twisted in the wind. 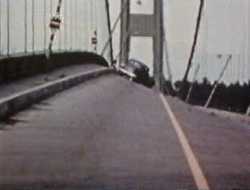 Note: the only death as a result of this bridge collapsing was a dog left in the car in the middle of the bridge. The dog was abandoned by its owner who fled to safety. 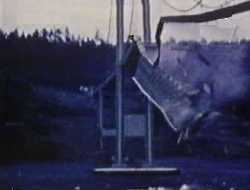 A few minutes after the first piece of concrete fell, this 600 foot section dropped into the water below, turning upside down as it crashed in Puget Sound. The floor assembly and the solid girders have been twisted and warped. The square object in mid air (near the centre of the photograph) is a 25 foot (7.6m) section of concrete pavement. Can you see the car in the top right corner? 1. What is meant by 'torsion'? 2. 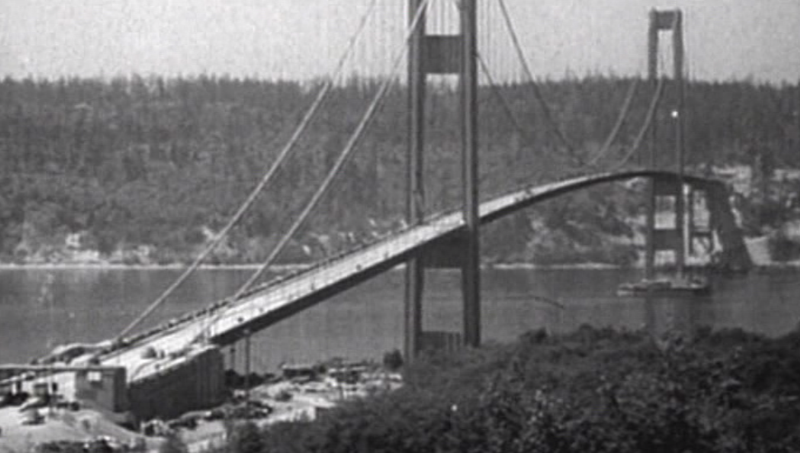 Draw a map showing the location of the Tacoma Narrows Bridge, before it collapsed.